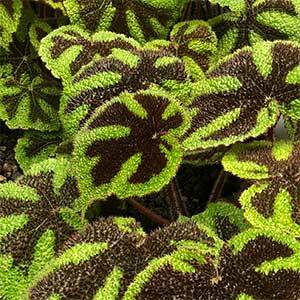 With its distinctive foliage, Begonia masoniana is commonly called the Iron Cross Begonia. Originally from Papua New Guinea this is a tropical plant widely grown as an indoor foliage plant. Being an understory plant, it does grow well in strong filtered light, and coming from tropical areas it does require a little care, however should not be regarded as difficult to grow. This is a Rhizomatous type begonia and is a plant that requires moisture and humidity, it grows well in good filtered light and an African Violet potting mix is suitable. It is the Iron cross pattern on the foliage that makes this such an attractive foliage plant. The cross itself is a deep reddish brown, the remaining foliage in a bright mid green, textured to add further interest. Given some humidity and filtered light Begonia masoniana is not difficult grow. It is best watered below the foliage to prevent spotting and mildew and can be fertilised with a diluted liquid fertiliser every 4 weeks while in active growth. Watering needs to carried out once the top part of the soil begins to dry a little. The temperature should not fall below 13C (50F) or the plant will suffer. Propagation is from stem cuttings. This is not a plant that is widely offered for sale at present. A good place to start is your local Begonia Society, or watch out for a Begonia Plant Show near you.